Sloan Lake in northwest Denver, CO is an excellent place to call home. Living here, residents enjoy a sparkling lake and recreation such as boating and fishing in their own back yards. The picturesque lake has miles of walking and biking trails where community members enjoy the downtown Denver skyline and the lake against the backdrop of the Rocky Mountains. In the mid-19th century, Sloan Lake did not exist. There are some local legends, but no official records about how the lake came to be. Sloan Lake was opened to the public in 1881 and now boasts trails, stunning views, and tennis and basketball courts. Sloan Lake is an inner-city oasis for residents and wildlife alike. Sloan Lake is just a short drive from downtown Denver. 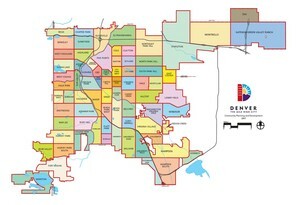 Conveniently close to I-25 and I-70, shopping, restaurants and entertainment are never far away. Homes in the area – just like the people – are diverse. Architectural styles include Tudor, Victorian and Bungalow. The Sloan Lake neighborhood has a fairly stable population with more than half of the residents here owning their homes. It’s no mystery why there are longtime residents who have enjoyed many decades of calling Sloan Lake home!